We carry several thicker window films, Armorcoat® for one actually makes glass stronger and shatter resistant, available in 4 to 14 mil thicknesses. Incredibly strong, optical-quality polyester, high-grade ultraviolet inhibitors, and special laminating and mounting adhesives are what make our safety films exceptionally tough. Once installed to the inside surface of glass, the special mounting adhesive forms a molecular bond, strengthening the overall integrity of the pane keeping glass fragments in place. Our films provides an effective and non-obtrusive defense against intruders, accidents, explosions and weather - helping to save lives and protect your property. 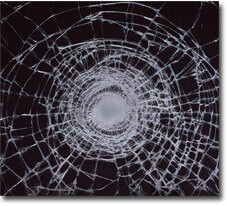 Dangerous glass shards caused by accidents or explosions can harm family members or employees. Hurricanes, tornadoes, earthquakes and wind storms can also send glass flying through the home or workplace. The Glass Protector safety and security films help hold shattered glass together, reducing the threat of serious injuries caused by deadly flying shards. When broken glass is held in place during a storm, additional protection from water damage can be experienced. Films range in thickness from 2 Mil to 14 Mil providing varying degrees of anti-penetration resistance. In addition to the clear undetectable films, they are also available in a variety of solar energy rejecting tinted versions. Protect yourself today! We have many notable installations. We are especially proud of being the approved General Services Administration (GSA) vendor for Armorcoat® brand safety and security films. Recent GSA installations include the Pentagon, the J. Edgar Hoover FBI Headquarters building and the Department of Energy. Armorcoat is also on the job protecting US and foreign military bases, airports and embassies around the world.